Courtney Force will begin Sunday’s Funny Car eliminations from the pole position. 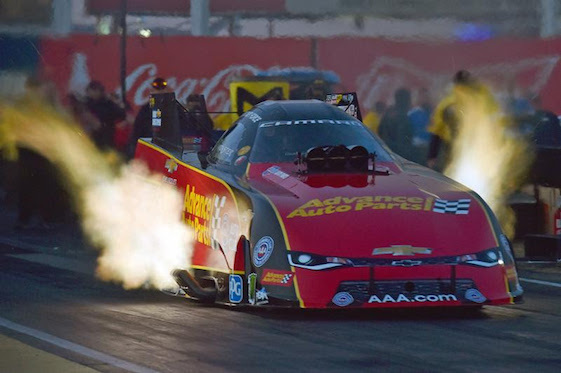 Courtney Force set both ends of the Funny Car track record Saturday at Wild Horse Pass Motorsports Park as qualifying concluded for the 34th annual NHRA Arizona Nationals. Force earned her first pole at the facility in Chandler, Ariz., with a 1,000-foot pass in 3.826-seconds at 335.98 mph. The lap ended a streak that had seen Force qualify No. 2 at the track outside Phoenix for three consecutive years. Force will line-up opposite veteran Del Worsham, the 2015 Funny Car world champ and driver of the Lucas Oil Toyota Camry, in Round One on Sunday. Force _ whose most recent victory was scored at Royal Purple Raceway in Baytown, Texas, in 2016 _ is 9-10 overall against Worsham. Ron Capps, the 2016 world champion from Don Schumacher Racing, sits second after a pass in 3.844-seconds at 330.80 mph in his NAPA Auto Parts Dodge Charger R/T. Two-time/reigning world champ Robert Hight of JFR qualified 11th at 3.927-seconds and 329.26 in his Auto Club of Southern California Camaro SS. And after failing to record a full-pass during Friday’s two sessions, 16-time world champion John Force ran 3.864-seconds at 332.51 mph during Q3 to land the No. 4 spot. In other professional qualifying, Tony Schumacher (Top Fuel) and Deric Kramer (Pro Stock) secured poles in their respective categories at the second of 24 events on the 2018 NHRA Mello Yello Drag Racing Series schedule. Fox Sports 1 will air three hours of live coverage of Sunday’s finals beginning at 6:30 p.m. (EST). Friday’s provisional No. 1 qualifier, Schumacher held serve to bag his 85th career No. 1 in Top Fuel with a 1,000-foot run of 3.649-seconds at 334.65 mph posted during Friday’s first session. Schumacher also set the Top Fuel national speed record at 336.57 mph with an elapsed time of 3.667-seconds during his second pass on Friday. Schumacher collected an impressive seven bonus points en route to his sixth Wild Horse Pass pole, including closing-out qualifying with another session-best effort. “Mike backed it down on that (last) run and it did what it was supposed to do,” Schumacher said. “The conditions for the last round should have produced a better run than we put up (Friday) night, but the track is just extremely good and it’s eating the cars up. They’re blowing through the clutch. You hit the gas and it just chews that clutch up. Teams were trying, but they weren’t getting it done. Schumacher will go head-to-head against Greg Carrillo in Round One. Steve Torrence, an eight-time winner last season, qualified second after running 3.665-seconds at 331.45 mph in his Capco Contractors dragster. Reigning world champion Brittany Force qualified 14th in her return to the cockpit after escaping serious injury in a season-opening crash during the Winternationals at Pomona, Calif., on Feb. 11. Force will race veteran Clay Millican and his Great Clips/Parts Plus dragster in Round One. Millican is 7-3 against Force. In Pro Stock, Kramer secured his first career pole after covering the traditional quarter-mile in 6.522-seconds at 210.80 mph in his American Ethanol Chevrolet Camaro SS during the fourth qualifying session. Kramer, a newcomer to Ken Black Racing, is ready to notch his first career victory. Kramer is matched against Alan Prusiensky and his eCarMover.com Dodge Dart in Round One. Two-time world champion Erica Enders of Elite Motorsports qualified her McLeoad Clutches Camaro SS second while provisional pole-sitter Alex Laughlin earned the third spot in his Hot Wheels Camaro. Reigning world champion Bo Butner, Kramer’s KBR teammate, grabbed the No. 6 position at 6.532-seconds at 210.34 mph in the final session. Butner, driver of the Jim Butner’s Auto Sales Camaro SS, had lingered in the 6.57-6.58 range until that last qualifying run. “We’re on the edge of our seats, and the whole start to the season has been like that for us,” Butner said. The Winternationals winner, Butner will race five-time world champion Jeg Coughlin Jr. in the Elite Motorsports/Jeg’s.com Camaro in Round One. “Some good things have happened and we’ve improved,” Butner said. “It’s like I said before, I like to get ‘most improved,’ and I think we did that last qualifying round. We qualified No. 6 in Pomona and won the race, and we’re qualified No. 6 here. It won’t be any easy ride by any means, but it’ll be fun. Top Fuel _ 1. Tony Schumacher, 3.649-seconds, 336.57 mph vs. 16. Greg Carrillo, 4.227, 220.91; 2. Steve Torrence, 3.655, 331.85 vs. 15. Steven Chrisman, 4.089, 281.30; 3. Clay Millican, 3.664, 335.23 vs. 14. Brittany Force, 3.828, 253.52; 4. Leah Pritchett, 3.679, 334.15 vs. 13. Troy Buff, 3.809, 318.77; 5. Richie Crampton, 3.683, 325.30 vs. 12. Scott Palmer, 3.788, 326.63; 6. Billy Torrence, 3.697, 331.45 vs. 11. Doug Kalitta, 3.742, 328.78; 7. Blake Alexander, 3.705, 332.59 vs. 10. Terry McMillen, 3.740, 325.85; 8. Antron Brown, 3.712, 333.66 vs. 9. Mike Salinas, 3.737, 326.32. Did Not Qualify _ 17. Kebin Kinsley, 5.118, 136.79; 18. Terry Totten, 8.158, 69.73; 19. Terry Haddock, 10.095, 91.23. Funny Car _ 1. Courtney Force, Chevy Camaro, 3.826, 335.98 vs. 16. Del Worsham, Toyota Camry, 5.089, 173.99; 2. Ron Capps, Dodge Charger, 3.844, 330.80 vs. 15. Tim Wilkerson, Ford Mustang, 4.551, 182.82; 3. Jack Beckman, Charger, 3.845, 332.43 vs. 14. Richard Townsend, Camry, 4.244, 235.27; 4. John Force, Camaro, 3.864, 332.51 vs. 13. Jeff Diehl, Camry, 4.120, 307.79; 5. Jonnie Lindberg, Camry, 3.866, 317.27 vs. 12. Bob Tasca III, Mustang, 3.971, 316.75; 6. Tommy Johnson Jr., Charger, 3.879, 329.91 vs. 11. Robert Hight, Camaro, 3.927, 329.26; 7. Cruz Pedregon, Camry, 3.888, 333.25 vs. 10. Shawn Langdon, Camry, 3.927, 329.42; 8. J.R. Todd, Camry, 3.919, 324.20 vs. 9. Matt Hagan, Charger, 3.926, 330.88. Did Not Qualify _ 17. Jim Campbell, 7.402, 91.58. Pro Stock _ 1. Deric Kramer, Chevy Camaro, 6.522, 211.00 vs. 16. Alan Prusiensky, Dodge Dart, 6.663, 207.94; 2. Erica Enders, Camaro, 6.527, 209.98 vs. 15. Steve Graham, Camaro, 6.659, 208.55; 3. Alex Laughlin, Camaro, 6.529, 209.59 vs. 14. Val Smeland, Camaro, 6.640, 209.69; 4. Greg Anderson, Camaro, 6.530, 211.66 vs. 13. Kenny Delco, Camaro, 6.581, 209.82; 5. Jason Line, Camaro, 6.531, 211.03 vs. 12. Vincent Nobile, Camaro, 6.567, 210.08; 6. Bo Butner, Camaro, 6.532, 210.60 vs. 11. Jeg Coughlin Jr., Camaro, 6.553, 210.14; 7. Chris McGaha, Camaro, 6.534, 211.63 vs. 10. Tanner Gray, Camaro, 6.550, 210.41; 8. Matt Hartford, Camaro, 6.542, 210.05 vs. 9. Drew Skillman, Camaro, 6.550, 211.39. Did Not Qualify _ 17. Joey Grose, 6.720, 206.64.